In this age of digital communication, do conferences still play an important role in research and conservation? SOSF principal scientist Sarah Fowler thinks so, and she explains why. Walking along the corridors during coffee breaks at Sharks International in Durban, June 2014, took me back in time. I don’t mean just a few years to the first Sharks International conference in Cairns, Australia, in 2010, but all the way back to 1992 and ‘Sharks Down Under’ in Sydney. That was my first international shark conference. 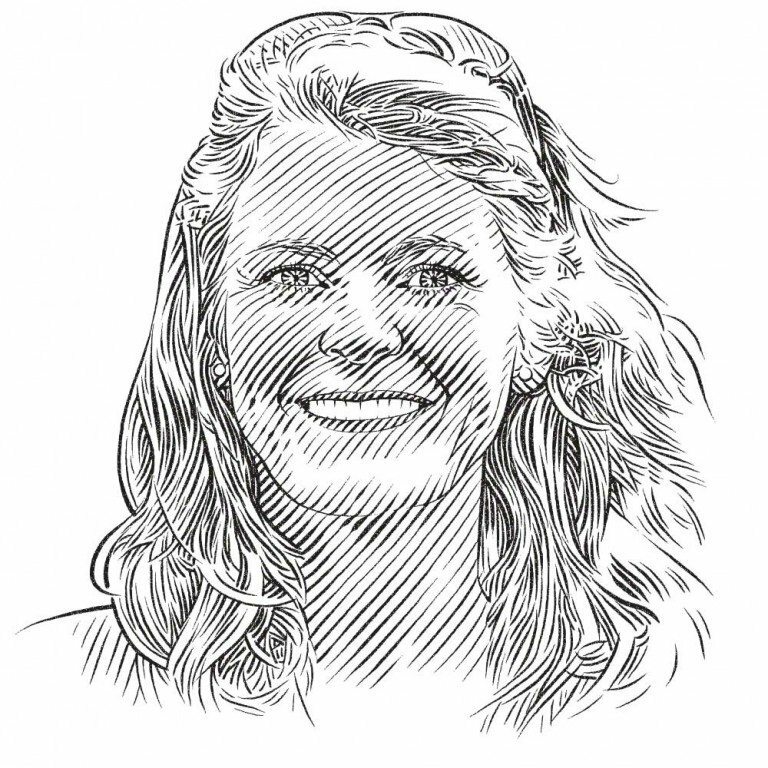 It was a huge eye-opener to a marine ecologist from the United Kingdom, where the subject of shark conservation was rarely mentioned and very few people even knew that there were sharks in British waters. Although 22 years have passed since then, there were some striking similarities between the two meetings. In Sydney there was a whole symposium on shark-control programmes for bathing beaches (it reached the conclusion that once such programmes are introduced, local politics make it impossible to halt them – so don’t start!). Early results of shark-tagging programmes were presented (using conventional visual tags, naturally) and there were talks warning of the vulnerability of shark species to overfishing, persecution and the threat posed by the steeply rising demand for fins in East Asia during the late 1980s. Most importantly, the delegates of almost a generation ago shared with those of today a contagious fascination and enthusiasm for, and dedication to, these animals. In other respects, however, a great deal has changed in two decades (and I am not just referring to the grey hairs of the ‘Sharks Down Under’ delegates who attended the Durban and many other intervening meetings). Our knowledge of the biology, ecology, species and populations of sharks has undergone a step change during the intervening decades. So too has our awareness that their flatter cousins (skates, rays, guitarfishes and sawfishes) are just as important and many of them are even more seriously threatened. Technology, too, has advanced at an astonishing rate. Some of the presentations during Sharks International left me open-mouthed in amazement at the huge strides in knowledge made possible by new technology, from acoustic and satellite tags to genetic analyses and novel methods for studying age and growth. No less remarkable is the ease with which such data can now be accessed. Are the stinky undergraduate dogfish dissections that I remember so well obsolete, now that the anatomical imagery presented by Gavin Naylor from the Chondrichthyes Tree of Life is available to all? I suspect that the audience in Sydney more than two decades ago would have considered some of this year’s papers to be highly elaborate practical jokes; science fiction carried to new heights of imagination. How could such tiny tags possibly record, archive and transmit such a huge range of movement and environmental data for such a long time? The first satellite tag used on basking sharks looked like a small lifeboat compared with today’s salt cellar-sized instruments! Even these techniques pale in comparison with the power of stable isotope analysis of tiny tissue samples to tell us so much about a shark’s lifetime of diet, habitat use and migrations. And yet, there we were this year, absorbing new techniques, new ideas, new results – but still only scratching the surface of the scientific knowledge necessary if we are to rise to the challenge of securing the future conservation and management of shark and ray populations. 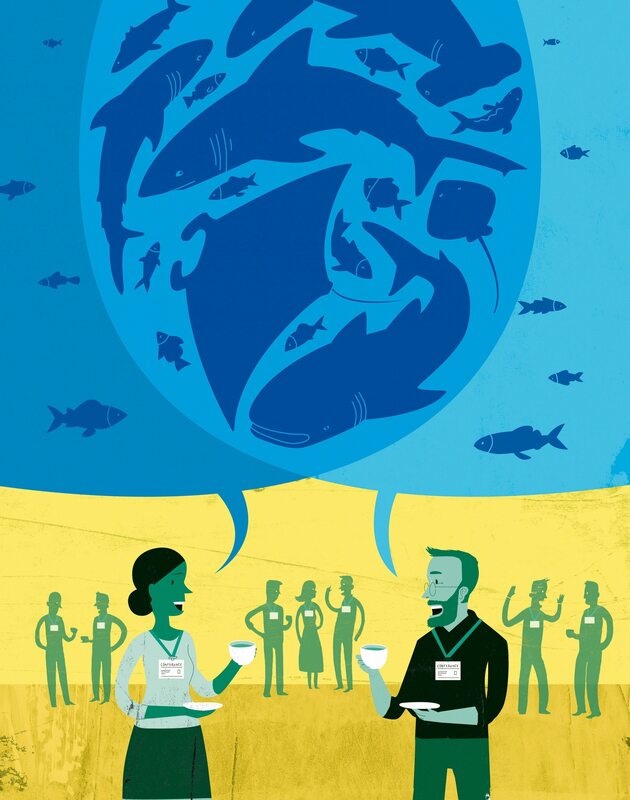 As a marine conservationist, I am sometimes challenged to explain how I can justify the air miles and fossil fuels consumed to bring scientists together at these conferences, when new technologies mean that face-to-face meetings are no longer necessary. Surely we could as easily gain this new knowledge by logging on to watch presentations online from our homes or workplaces at an hour convenient to our time zone? Or we could ‘meet’ just as effectively, and perhaps even more efficiently, in virtual chat rooms or video conferences? Looking back over the past 20 years, can we estimate the extent to which advances in shark research and conservation have, at least in part, been generated by the collaboration and direct exchange of ideas between delegates at these meetings? That’s a tough question to answer. After all, conferences only take place because many scientists have already generated interesting new research results for presentation, the essential prerequisite for such meetings. Furthermore, other scientific meetings dedicated to chondrichthyan research take place more frequently, including those of the American, Japanese, European, Brazilian and Oceania societies or associations, and they too stimulate the development and publication of research within those regions. Nevertheless, I am convinced that the exponential rise in the number of scientific papers published annually since the early 1990s is due at least in part not only to the opportunities for collaboration that these major international meetings provide, but also to the contribution they make to building research capacity and encouraging engagement in conservation activity. The number of currently recognised shark and ray species described in each decade since 1785 and the cumulative number of species. Source: White W.T. and Last P.R. 2012. A review of the taxonomy of chondrichthyan fishes: a modern perspective. Journal of Fish Biology 80: 901–917. The rise in numbers of ‘new’ shark and ray species described by scientists since that first major meeting back in 1992 is also interesting. A quick look at the first graph overleaf shows how the relatively constant rate of species discoveries from 1758 makes a noticeable jump in the 2000s. This is primarily the result of major research efforts by Australian shark taxonomists describing a large number of recently discovered Australian endemics and subsequently other new species from the Indo-Pacific region. Some of these species descriptions are wholly ‘home-grown’ within the Australian research community and owe very little to international collaboration. Others, however, can be attributed to the joint initiatives of shark biologists from several countries, possibly inspired by the seeds of ideas planted during international meetings when scientists first met, face to face. Another way to assess the direct contribution of such meetings to shark conservation and research is to consider particular taxonomic groups, such as those that have been the focus of research funded by the Save Our Seas Foundation (SOSF). In 2012, the SOSF funded an IUCN Shark Specialist Group project to develop a conservation plan for the largely forgotten and Critically Endangered sawfishes. It kicked off with a planning workshop at the Zoological Society of London that was attended by scientists from all over the world, many of whom had never met before. The same impact and degree of collaboration could never have been obtained without a face-to-face meeting. In a few years from now, when we review scientific papers about the sawfishes, I am sure that we will clearly see the results of this first sawfish meeting. They will be measurable not only in the form of increased research attention and output, but also in the methods employed to protect important species, such as including them in regional and international agreements and adding them to national protected species lists. As another example, since its inception the SOSF has supported several long-term studies on manta rays and recently broadened its scope to include their smaller and poorly known relatives, the devil rays. Also known as mobulid rays, they are probably just as threatened as mantas – and just as interesting. A comparison of the numbers of papers published on manta rays and devil rays (see the second graph above) shows a large increase in manta ray publications in recent years, whereas the more numerous species of devil rays have so far received scant attention. An SOSF call for proposals for devil ray projects has now stimulated new research into these animals in a number of regions, ranging from the eastern Mediterranean to Pakistan, the Philippines and Peru, and at the same time has provided, at a global level, the identification tools needed for these studies. Recent publications on manta and mobula rays. Source: Couturier et al. 2012. Biology, ecology and conservation of the Mobulidae. Journal of Fish Biology 80: 1075–1119. Most recently, immediately after the Sharks International conference, the SOSF funded an IUCN Shark Specialist Group conservation planning workshop for manta and devil rays, similar to that convened a few years ago for sawfishes. Devil ray researchers who had never met before spent several days discussing and agreeing on conservation and management objectives, goals and actions for their species. I confidently predict that in a few years from now a review of the publications for manta and devil rays will show a significant increase in the number of research papers. And, as happened with sawfishes, there will be an increase in conservation and management initiatives aimed at improving the status of these poorly known animals. Of course, virtual meetings can be very useful in many circumstances (particularly for those of us who already travel far too much and have grown to dread the journey to the airport), but they are not the same. I very much doubt whether the above success stories would have been possible if many key individuals had not been able to meet face to face. Nothing is as effective and productive as getting away from our offices and laboratories every few years to meet old and new colleagues and exchange scientific findings and novel ideas, not just in presentation and poster sessions, but informally in coffee breaks, dining rooms, restaurants and bars. It is, literally, in the corridors and over coffee cups that researchers have the invaluable opportunity to swap, compare and generate new theories and ideas, discuss potential future collaborations and make or renew personal and professional friendships that will yield scientific dividends for years to come. It’s also where students discover new mentors and realise that it’s possible to meet and talk to their role models (and discover that they are ordinary people, just like them), thus setting them off on careers that will change their lives. We are social animals and we need to meet socially every now and then if we are to create and reinforce the scientific communities that produce the amazing new results presented at Sharks International and other such gatherings. I believe that advances in research, conservation and management depend ultimately on individuals: getting to know one another and discovering common goals, then working together to achieve them. It is hugely gratifying to know that the SOSF, through its sponsorship of conferences and workshops, provides so many shark scientists with the opportunities to do just this.